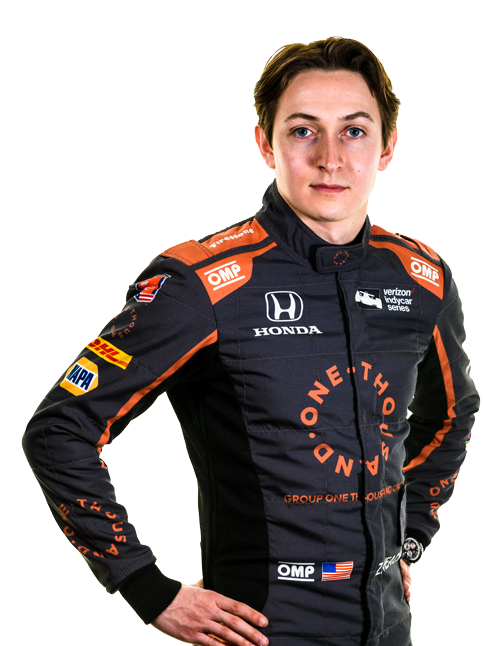 Zach Veach is an American racing driver, who has climbed the Mazda Road to Indy ladder system to become a Verizon IndyCar driver. A native of Stockdale, Ohio, Zach started karting in 2007 at the age of twelve where he began racing at Circleville Raceway Park in Circleville Ohio. In 2010 transitioned from karting to USF2000 when he was signed by Andretti Autosport as a developmental driver. Over the next 4 seasons Zach climbed the Mazda Road to Indy Ladder with Andretti competing in USF2000, ProMazda and IndyLights. In 2016 after setting out of the 2015 season due to an injury, Zach returned to IndyLights with Belardi Autosport. In his 6 year Mazda Road to Indy Career, Zach has recorded 13 Wins, 14 Poles, 39 Podiums and 56 Top Five Finishes. In 2017 Zach made his Verizon IndyCar Series debut at Barber Motorsports Park and his Indy 500 debut which lead to a partnership with Group One Thousand One which secured the opportunity for Zach to return to Andretti Autosport as a full time Verizon IndyCar Driver making Zach the only driver to ever compete in all 4 levels of the Mazda Road to Indy with one team and Andretti Autosport. Outside of racing, Zach is a published author, avid rock climber, and environmental activist.